Written by Irene Anton on July 2, 2018 . Posted in General News, Group activities. 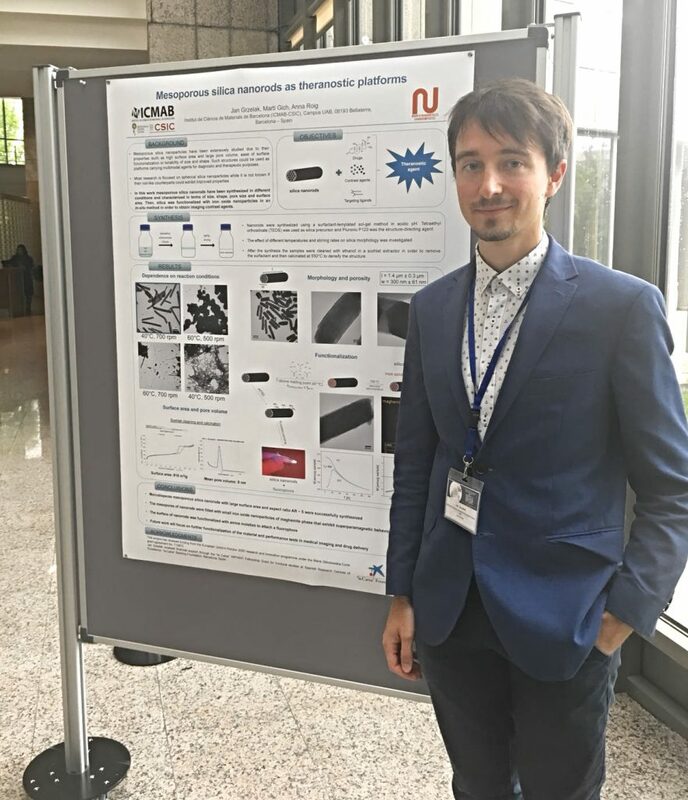 Miquel Torras, PhD student at the N&N group, travelled to Madrid to attend the 3rd International Conference on Polyol Mediated Synthesis (ICPMS) held at the Instituto de Ciencia de Materiales de Madrid (ICMM). 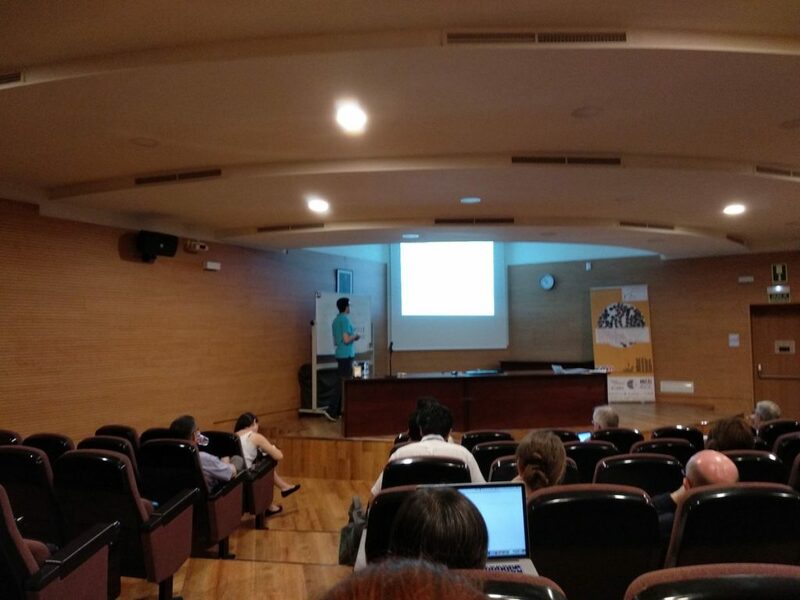 Miquel presented the talk “Fast and Simple Microwave Synthesis of Multicomponent Gold Nanoparticles”. Written by Irene Anton on June 8, 2018 . Posted in Conferences, General News, Group activities. 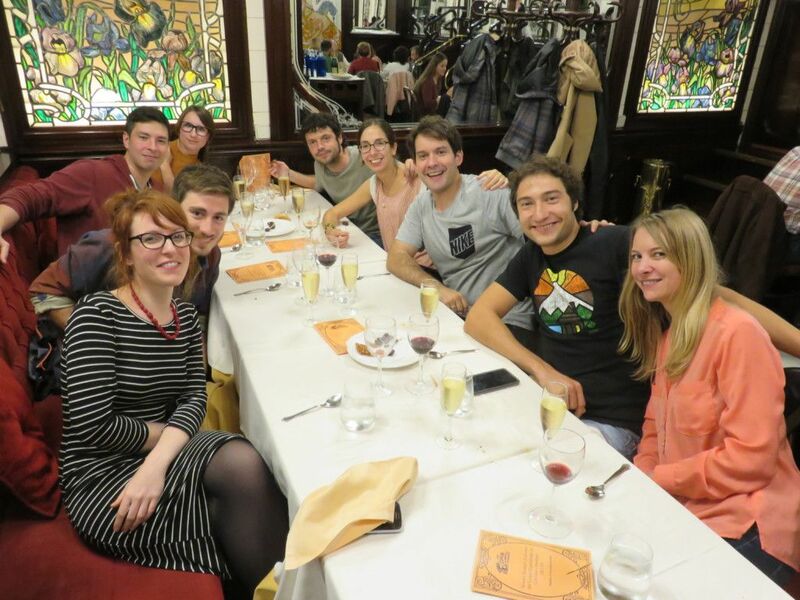 Jan Grzelak, PhD student at the N&N group, travelled to Madrid to attend the 1st Spanish Conference on Biomedical Applications of Nanomaterials (SBAN) held at the Instituto de Ciencia de Materiales de Madrid (ICMM). Jan presented the poster “Mesoporous silica nanorods as theranostic platforms”. Written by Irene Anton on September 13, 2017 . Posted in Awards and scholarships, Conferences, Group activities. 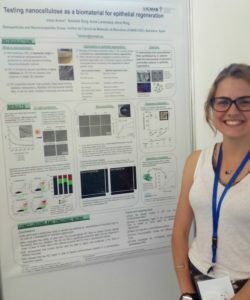 From the 3rd to the 8th of September of 2017 Irene Anton, a Ph.D. student from the N&N group, attended a big meeting of Colloids and Interfaces in Madrid (ECIS2017). 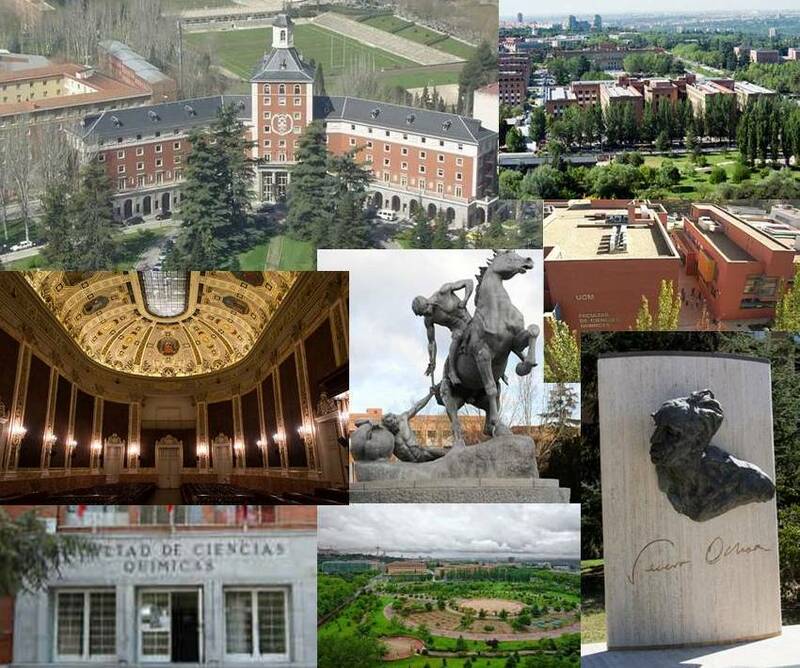 The event was hosted by the Universidad Complutense de Madrid. 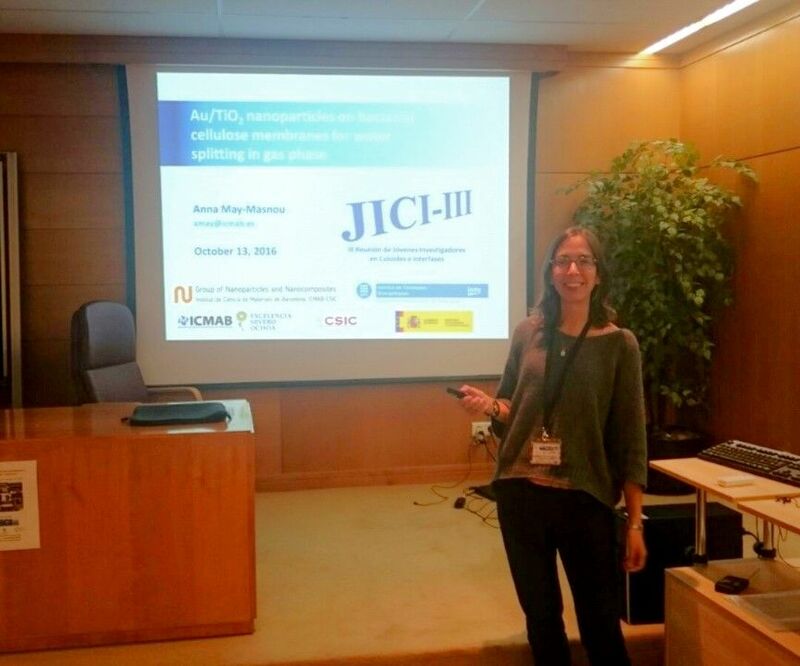 Irene participated with two posters and was awarded with one of the two prizes sponsored by the journal Polymers. Written by Anna May on October 13, 2016 . Posted in Conferences, News. Anna May will give the talk “Au/TiO2 nanoparticles on bacterial cellulose membranes for water splitting in gas phase” in the III Meeting of Young Researchers in Colloids and Intrefaces (III Reunión de Jóvenes Investigadores en Coloides e Interfases), which is held in the Universidad Complutense of Madrid, during October 13-14, 2016. 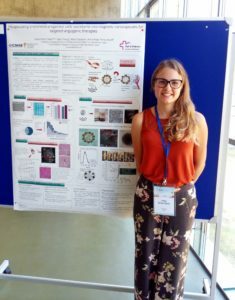 The work presented is in the framework of the Engineering Bacterial Cellulose Nanocomposites project from ICMAB, in collaboration with Jordi Llorca and Lluís Soler, from the Institut de Tècniques Energètiques (INTE) at the Universitat Politècnica de Catalunya (UPC). The meeting is organized by the “Grupo Especializado de Coloides e Interfases“, the Real Sociedad Española de Física, and the Real Sociedad Española de Química. Written by jags on August 23, 2013 . Posted in General News. 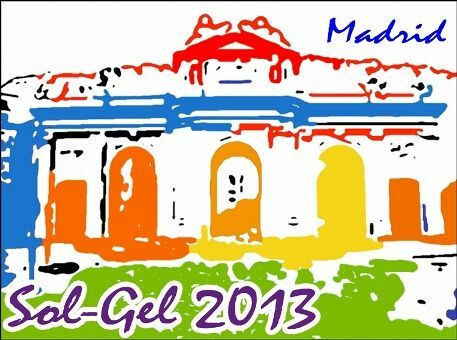 The International Sol-Gel Conference will be held in Madrid the coming week. The N&N group will be represented by Nerea, Muling and Pengfei. Nerea will give a talk. The cost action MP1202 Hybrid Interfaces is organising a Workshop in Madrid next 2-3 of September. Anna Laromaine and Anna Roig will give two oral presentations there.